Teens are starving for attention from adults who believe in them. A teen who doesn’t have a healthy relationship with an adult will often lack self confidence. They are less likely to develop communication and social skills needed to establish strong personal boundaries because no one is available to be a role model. Mentoring programs are a great way to match young people with a caring adult. Adult mentors are usually unrelated to the child or teen and work as volunteers through community, school or church based programs. Training is essential to mentoring programs. Not every volunteer possesses the qualities, emotional stability or skills to be a mentor. The most successful mentoring programs interview potential mentors and offer mentor training. They consistently check in with mentors and mentees to monitor progress and track feedback. We’ve outlined a few great ideas for mentors to become successful while participating in mentoring programs. Build relationships on trust. Many teens without mature role models are suspicious of adults. Do not try to become your mentees best friend or a substitute parent. Mentoring programs will be looking for positive role models who invite open communication and mutual respect. Create realistic goals and expectations. Do not expect your mentee to confide in you right away. Ask questions and get to know your mentee. As your relationship grows, your mentee will feel more comfortable sharing his or her life with you. Have fun together. Find out what kind of activities your mentee enjoys. Go bowling or watch a good movie. Shoot some hoops, play a round of putt-putt golf, walk through the mall or go grab a snack at a food bar. You don’t need to spend a lot of money to build a strong mentor/mentee relationship, what’s most valuable is your time together. Discuss decisions about activities with your mentee. Some teens may be shy to suggest ideas because they don’t want to appear rude or needy. Others are content to let you make the decisions, especially in the beginning stages of your relationship. When you ask your mentee for input, this shows you value his or her ideas. Allow your mentee to reveal personal information when they are ready. Give your mentee permission to reveal how much or how little information they wish to share with you. Remind them that they can share with you without fear of judgement. Listen. When you ask questions and listen, you give mentees permission to share their stories and personal experiences without criticism. Be positive. Briefly share your own experiences to demonstrate empathy, but your time together is not about you – it’s about your mentee. Do not bog down your time or monopolize conversations with stories about your struggles when you were growing up. If your mentee feels “stuck,” remind him or her they can change their perspective by changing their thoughts. DREAM’s Becoming A Man team mentoring programs match college-educated, professional male mentors with at-risk young men. Together, mentors and mentees work through a strengths-based curriculum, which includes decision-making, accountability, self-efficacy and strategic goal setting. We’re always looking for mentors throughout Omaha, NE, and Springfield, MO. 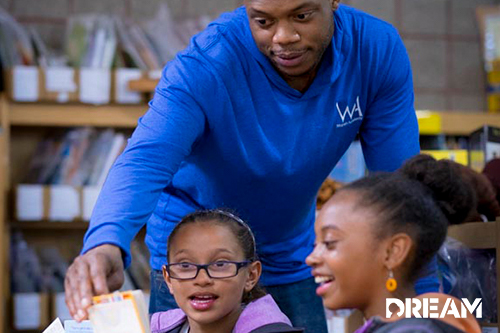 If you want to make a huge impact in a child’s life, volunteer with DREAM.